BATTLE CREEK, Mich. — Kellogg’s Pringles brand is bringing back three favorites from last year’s limited edition Pringles Thanksgiving Dinner collection: Turkey, Stuffing, and Pumpkin Pie. 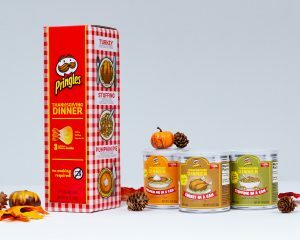 Designed to mimic the canned goods in consumers’ pantries during the holiday season, Pringles Thanksgiving Crisps come in mini Pringles cans. Beginning November 6 at 11:59 pm (Eastern Time), consumers can purchase a 3-pack of Pringles Thanksgiving crisps for $14.99 at https://www.kelloggstore.com/pringles-thanksgiving-in-a-can. Supplies are limited and are on a first-come, first-serve basis. Consumers can get more information by following @PringlesUS on Instagram and check out Facebook.com/Pringles.